Last year Boehringer Ingelheim took some big strategic decisions that it hopes will keep it on course to maintain its competitiveness and sustainable business development. Chief among these moves were the German company's exit from the generics business, via a $2.6bn deal with specialty firm Hikma, and its forthcoming asset swap with Sanofi. The latter deal will see Boehringer hand its consumer health interests to Sanofi in return for the French pharma firm's animal health arm Merial. Contracts for this are due to be signed by 30 June, with Boehringer's management expecting the deal to be finalised by the end of this year. Internal changes are also in the offing from July, when Boehringer's R&D operations, led by Dr Michel Pairet, will be renamed the 'Innovation Unit' and tasked with all stages of development up to clinical proof-of-concept. Meanwhile, a 'Prescription Medicines Business Unit' led by Allan Hillgrove will take on responsibility for the subsequent 'highly market-oriented development' of products. Overseeing these strategic manoeuvres will be Hubertus von Baumbach, who takes over as chairman of the board of managing directors from Prof Andreas Barner on 1 July. But leading the charge from an HR perspective will be Andreas Neumann. 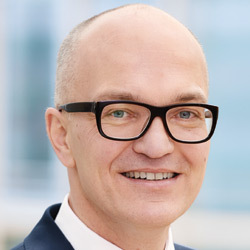 Neumann was appointed to his present role, where he has responsibility for the corporate human resources board division, last September, having joined the German pharmaceutical company in 2011 and managed its corporate legal division, ahead of assuming charge of its human resources corporate division in early 2015. PME joined him recently in Ingelheim, Germany to look at how the personnel implications of such changes are managed, as well as the role of company culture, when it comes to recruiting and retaining talent. Neumann noted that the changes at Boehringer, and particularly its deal with Sanofi, will be “transformational” for his company, but he said that, for him, it was part of a wider context of change. “When I look at Boehringer, I think about transformation times three,” which he says encompasses firstly rapid changes in the company's external environment and secondly the way Boehringer is transforming itself. Andreas says he prefers to see these changes as “opportunities, rather than challenges”. But looking at how a transaction such as the yet-to-be-completed asset swap with Sanofi is managed, from a people perspective, he notes that such transactions are a big deal for an organisation. Turning to the role of company culture, and Boehringer's own culture specifically, Neumann sees it as one of the fundamental ways for a firm to retain talented individuals. “In my mind, there are a number of reasons why people leave an organisation or decide not to join an organisation. One is they don't like the culture. Second, they don't like their respective leader. Third is they don't see the opportunity for personal growth, or fourth, there is just a better opportunity, a once-in-a-lifetime opportunity coming up. Moving forward to 21st century challenges and the Boehringer of today will soon have four generations working within its Ingelheim headquarters, all with their different needs and motivations.